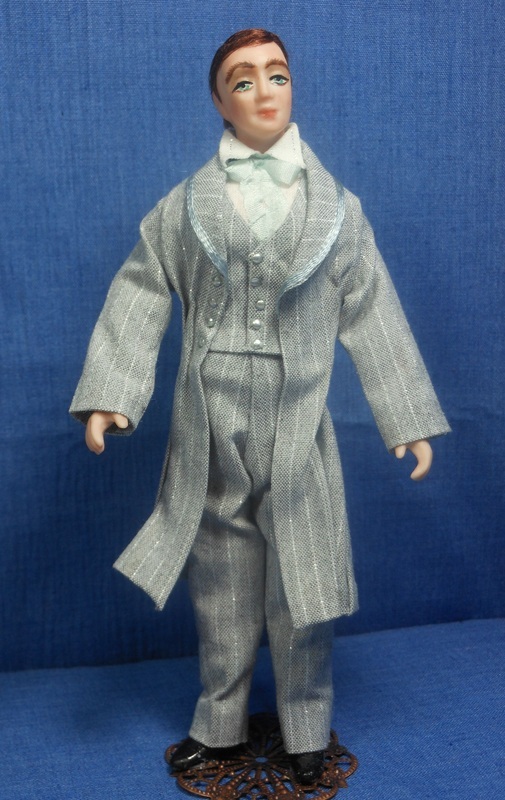 Jacob is a gentleman standing approximately 6” tall. He is wearing a suit of gray with silver streaks in it. He has on a shirt with the same silver streaks. His vest and coat have nice silver buttons on them. Jacob’s silk tie is a bluish gray and tied in a large bow. He is gently poseable at the shoulders, elbows and neck areas. He is wearing black shoes. Glenn is a nice looking young gentleman ready for a day at the club or a party. He has on a white shirt, black silk tie, and black and silver silk vest. He wears a nice suit of slacks and over coat of black silk. His dark brown hair is combed to frame his handsome face. He is gently poseable at the shoulders and elbows. He stands around 6” tall. Dr. Scott is a young doctor on his way to a meeting. He is dressed in a nice black and white checkered shirt and a black tie and wearing black striped slacks. He has his white lab coat on over his clothing. There are two large pockets on the lab coat that can hold tools, pens, etc. if you wish. 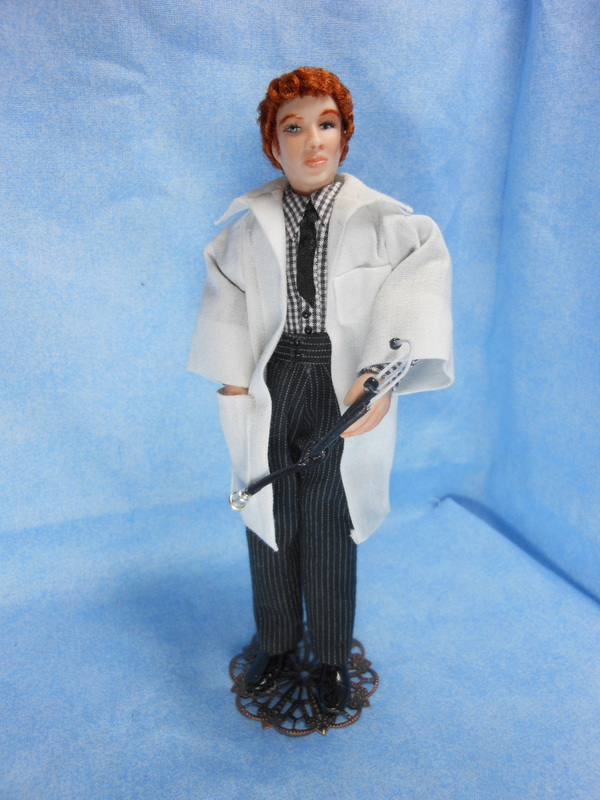 Dr. Scott has curly reddish hair. He is gently pose-able at the shoulders and elbows. He stands around 6” tall. Frank is an older gentleman who is working as a car hop or waiter. He is dressed in a white shirt with red trim around the cuffs of his sleeves and a red silk bow tie. His navy blue pants have a white stripe on each leg. His graying curly hair is neatly combed to stay under his waiter’s cap. 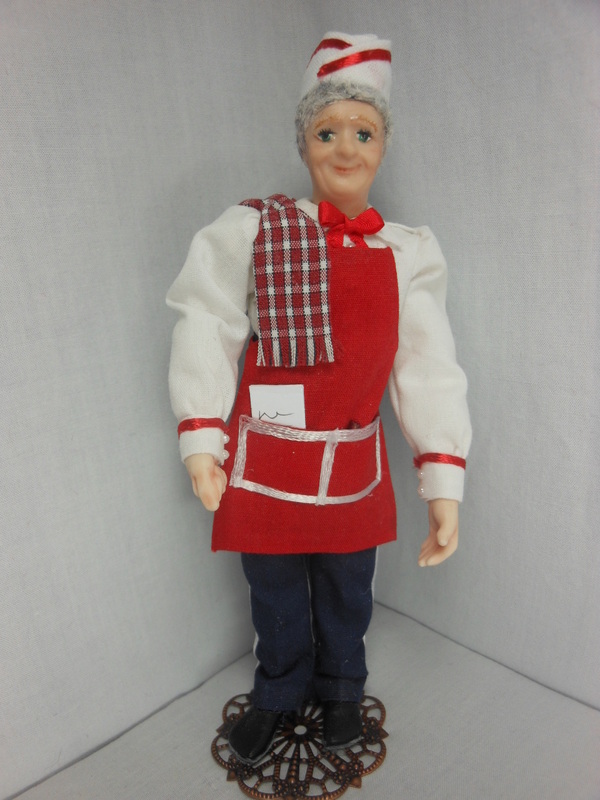 His apron is red with white trimming and holds his ordering tablet and pencil in the working pockets. He has a dish rag draped over his right shoulder. 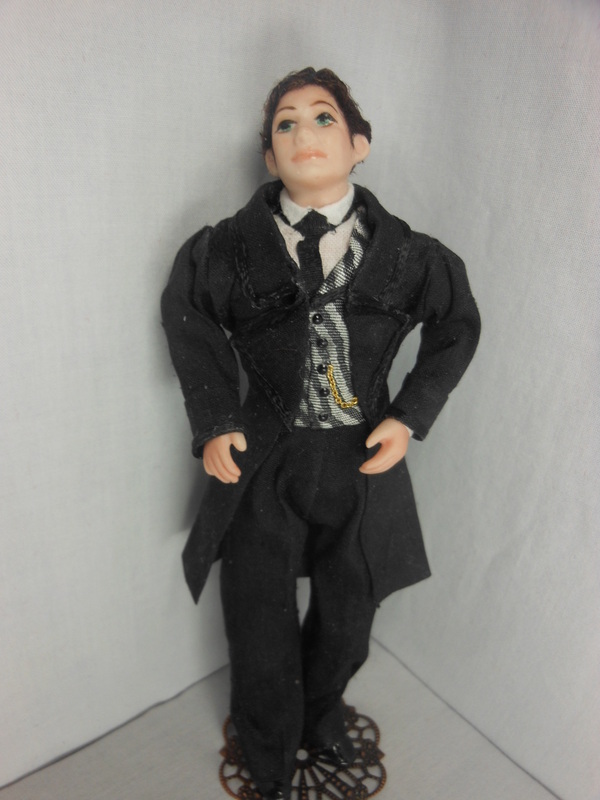 Frank is gently poseable at his neck, shoulders and elbows. He stands 5.6” tall. This is a doll made in porcelain to resemble Elvis in a 1:12 scale. 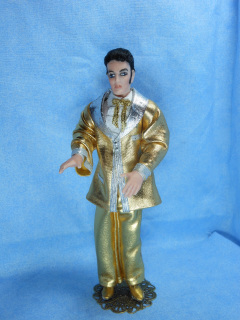 He is wearing his famous gold/silver suit. His slacks are made of shimmering gold fabric with a silver stripe down the outside of the pant legs. His jacket is shimmering gold fabric trimmed in silver lame at the cuffs, collar/lapel, and over each faux pocket. His eyes are china painted blue and his hair is made of black viscose. He stands approximately 6” tall. 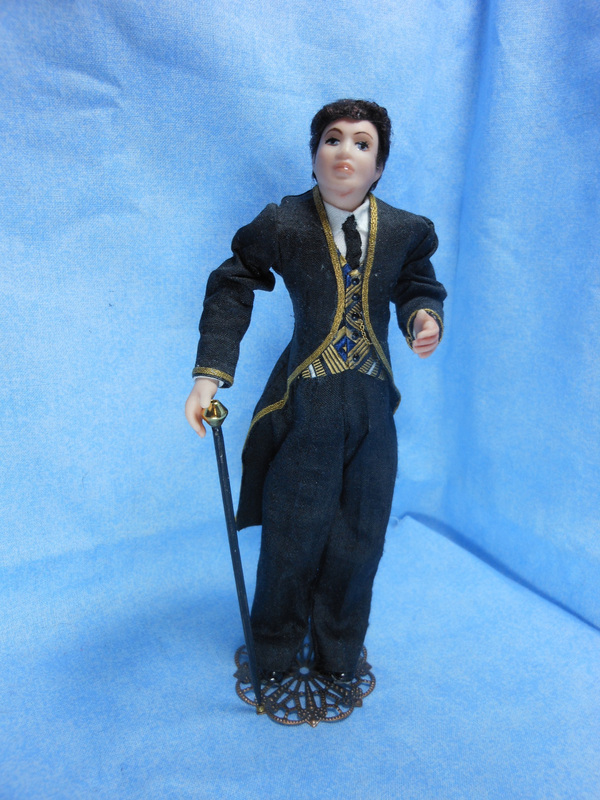 His head is gently pose-able (from side to side or facing frontward) and his shoulders and arms are able to move too. Sterling is a nice looking young gentleman ready for a day at the club or a party. He has on a white shirt, black silk tie, and black and gold with bits of blue and white silk vest. He wears a nice suit of black silk slacks and over coat of black silk trimmed in gold cord. His wavy dark brown hair is combed to frame his handsome face. He is gently pose-able at the neck, shoulders and elbows. He stands around 6” tall. Captain Havis is a sweet older man standing approximately 6” tall in 1:12 scale. He is wearing his navy blue slacks and overcoat of silk with 8 gold buttons down the front of it and a gold emblem on each collar front point. 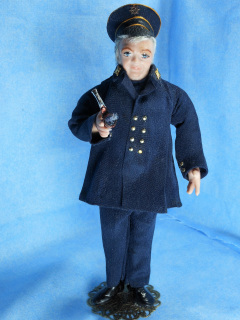 In his right hand he holds a smoking pipe. He has a nice sailors cap on his head of white curly hair. He could be a lighthouse keeper, old sailor, or just an older man looking out over his domain near the sea. He is gently pose-able at his shoulders and elbows. 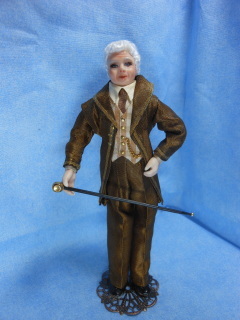 Sir Weston is a distinguished older man wearing his silk coffee colored suit. He’s ready for the Gentleman’s Club or to go out to a party or ball with a special lady. His trousers and over coat are made of silk. His vest is a patterned silk checkered light brown/tan color. There are five tiny buttons down the front of his vest. His faux watch fob chain is attached to the center button. He is wearing a beige silk shirt and brown tie. Sir Weston’s hair is white and lies in gentle waves around his head. He is gently pose-able at his shoulders and also at the elbows. He stands around 6” tall.